HHP faculty are taking the lead in a long term effort for preventing and treating obesity, type 2 diabetes and other ailments in Houston's underserved communities. The United Health Foundation has awarded a $2 million, three year grant to Dr. Dan O'Connor and Dr. Ezemenari Obasi (PHLS department at UH), fellows at UH’s recently launched HEALTH Research Institute. The project titled, Community Collaborative for Preventing and Treating Obesity in Underserved Communities In Houston (TOUCH), will focus on the Third Ward in years one and two and expand to the East End in year three. Dr. Dan O'Connor and Dr. Ezemenari Obasi are co-principal investigators on the project along with HHP faculty Dr. Marc Hamilton, Dr. Daphne Hernandez, Dr. Tracey Ledoux and Dr. Craig Johnston. Additional UH investigators working on the project include Dr. Reitzel, Dr. Correa, Dr. Fernandez, Dr. Olvera, and Dr. Murillo in the College of Education. The interdisciplinary project involves multiple UH units, includuing the HEALTH Research Institute, Texas Obesity Research Center (TORC), the Department of Psychological Health and Learning Sciences (PHLS), and the Department of Health and Human Performance (HHP). The project will implement the delivery of obesity prevention and treatment interventions to Houston’s underserved Third Ward population by bringing together an integrated network of partners and resources - UH researchers, community-based and faith-based organizations, schools and other educational groups, primary care clinics, local businesses, governmental entities, and both public and private funders. The total reach of the project’s program over the 3 years will be at least 7,000 individuals in approximately 5,000 families, most of whom will be African-American or Hispanic and with demonstrable socioeconomic stress (e.g., employment and income instability, food insecurity). 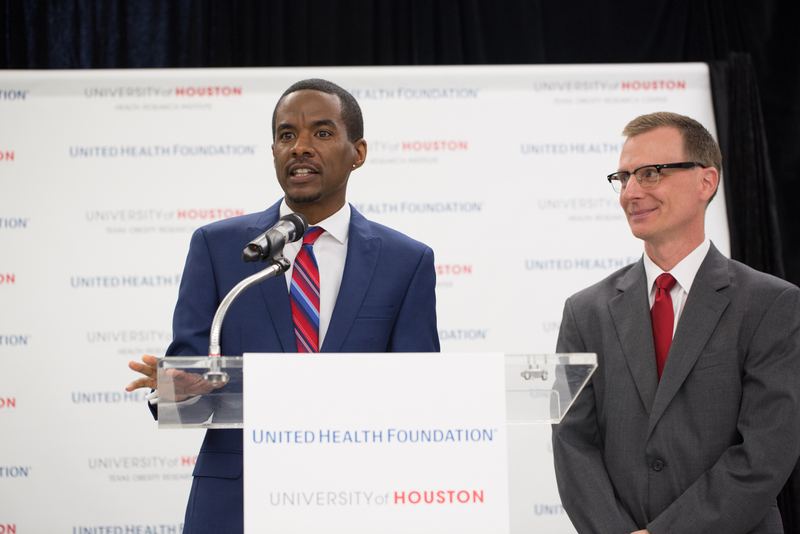 UH News featured the launch of the project in an article titled, "United Health Foundation, University of Houston Join Forces to Improve Public Health"
FOX 26 Houston featured the project in an interview with Dr. Dan O'Connor and Dr. Ezemenari Obasi.